Greetings Cat information lovers! 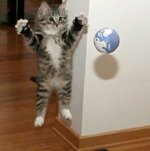 Being a cat lover myself, I have made a kind of hobby from collecting interesting bits of cat information and trivia over the years. There are so many fascinating things associated with cats, it’s hard to know where to begin! In this article, I will give general information and trivia. In later work, I will address the historical and mythological aspects of our favorite beast, the cat. Cats are more like us than most people know. They actually have regions in their brain responsible for emotion that are exactly like humans. Further, the cat’s brain is much more akin to the human brain than the canines. Ever wonder how your cat can seemingly melt into a tiny crack or opening when he wants to? That’s because the cat's collarbone doesn’t connect with other bones. Rather, it is buried in the muscles of the shoulder region. This allows them an incredible flexibility which enables them to fit through any opening at least the size of their head. Cats have 32 muscles that control the outer ear (compared to human's 6 muscles each). A cat can rotate its ears independently 180 degrees, and can turn in the direction of sound 10 times more quickly than those of even the best watchdog. Best not to tell Fido about this bit of cat information lest he get jealous! So the ears are very responsive in addition to being far more sensitive than either ours, or dogs. This bit of cat information is one that I find most interesting; cats can judge within 3 inches the precise location of a sound being made 1 yard away.One exception to the great hearing of cats is the pure white cat. These cats, most particularly the ones with blue or green eyes are frequently (but not always) deaf. Cats can be right-pawed or left-pawed, and they actually walk on their toes. Often a bald spot can be seen at the back of the leg, near the joint. This is perfectly normal, and is bald because that area gets a lot of pressure and wear, like our elbows. A cat sees about 6 times better than a human at night. A cat’s eye has a layer of extra reflecting cells called Tapetum Lucidum, which absorb light. 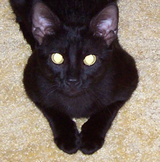 Any light that is not absorbed will pass back out, creating the characteristic “eye-shine” cats are known for. A cat's fixed field of vision is about 285 degrees. That is better than our human fixed field of vision which is 210 degrees. The cat’s eyes function best within 3 or 4 feet away. At that distance, the eyes provide the cat information far superior to what our eyes give us. But, further than that and their vision is not nearly as good. Of course this works out well for the cat, whose prey traditionally has been small ground dwelling mammals, and for hunting purposes, 3-4 feet is optimum for a powerful pounce. The agile feline predator is aided in his balance for climbing and pouncing by his tail! Almost 10% of a cat's bones are located in its tail. A cat's tail is actually a kind of extended backbone which is used to maintain balance. A cat has approximately 60 to 80 million olfactory cells (a human only has between 5 and 20 million). Often, when a cat encounters a particularly strong or tasty smell, you will see it grimace or grin. This is a flexing of the nose and lip known as “Flehmening”. 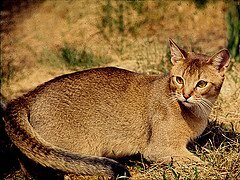 Flehmen behavior is believed to be in direct response to pheromones and other natural body odors, which stimulate the cat’s Jacobsen’s Organ. The Jacobson's organ is located behind the nasal area, and analyzes smells. This reaction is much stronger in the big cats than in domestic cats. While cats have amazing senses of smell, a little known fact of cat information is that due to the positioning of their eyes, cats cannot see directly under their noses! Whiskers and Jaws and Tongues, Oh My! A cat has a total of 24 whiskers, 4 rows of whiskers on each side. The upper two rows can move independently of the bottom two rows. A cat uses its whiskers for measuring distances and to obtain vital cat information from it's environment. 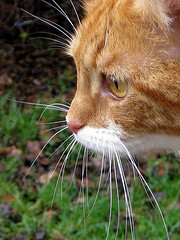 The whiskers of a cat are capable of registering very small changes in air pressure and temperature. A cat's jaw has only up and down motion; it does not have any lateral, side to side motion, like dogs and humans. So cats cannot grind their food as we can. This makes brushing the teeth even more important since all the hard kibble in the world won’t fully clean your cat’s teeth. While there is a lot of cat information out there about brushing kitty's teeth, if just isn't always practical. There are some kinds of cat treats that help reduce plaque and tartar build up. A cat's tongue has tiny barbs called “Papillae” on it. These serve two functions – First, they help strip meat from the bones of prey, and second, they aid in grooming, acting much like a fine tooth comb. Grooming is a big deal to most cats. While they may gradually groom less as they age, the average house cat spends a good deal of his waking time performing grooming. Cats lose almost as much fluid (in the form of saliva) while grooming themselves as they do through urination. So it’s important to make sure your cat always has a source of fresh, clean water available. Cats have a resting pulse of 140-240 beats per minute, with an average of 195. They average 20-40 breaths per minute and maintain an average body temperature of 102 (F). Cat's urine glows under a black light and pet stores now sell small portable black lights as “Urine Detectors”. The research for cat information is sometimes very surprising. For instance, not all cats enjoy the hallucinogenic effects of catnip. 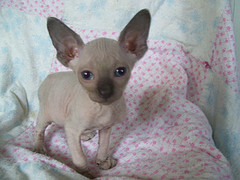 Younger cats generally don't like it until they are about 6 months old. Many adult cats are not genetically predisposed to catnip sensitivity. About 20 percent don't have the specific gene that causes the reaction to catnip and are completely unaffected by it. Catnip is non addictive. Further, while sniffing catnip may excite some cats, eating it has the opposite effect, making them calm and drowsy. Speaking of drowsy, did you know that adult cats spend about 15 percent of their lives in deep sleep? They are in a light sleep state about 50 percent of the time. That leaves them totally awake for just 35 percent of the time, or roughly 6-8 hours a day. But don't let that bit of cat information fool you. Just because kitty looks asleep that doesn’t mean he is defenseless. Ever on the alert, cats come back from sleeping to a state of full alertness faster than any other animal on earth. Once they are fully awake and ready for play, a cat tree cat tree is a good thing to have, since cats can jump 5 times as high as they are tall.Declawing a cat is the same as cutting a human's fingers off at the knuckle. If you love your cat, you will not do this barbaric procedure to him. Instead, train your cat to use a scratching post. There is so much more cat information to see that I may add another page to this section later on. Such fascinating creatures are most worthy of study and admiration, and we are very lucky to be caretakers for them. Hopefully you’ve found something of interest or maybe even something helpful in this article. If you have questions, as always, I am happy to hear from you. Just use the “Meow-Mail” button at top left of the page.